When it comes to beauty treatments, I�m definitely in the DIY camp if we exclude facials. One coat of a black nail polish and that's it, 5 minutes with a curling iron and I'm good to go! Little bit of mascara, brow gel and foundation and I did my make up. You will ask me later if I put anything at all on my face, but that's my style. Natural. The key is in simplicity and obviously I know the best. You don't want me as your client, trust me. And when it comes to hair removal I'm always in a doubt. Shaving, home/salon waxing and now IPL. Insert confused emoji here. Should I get rid of them in a beauty salon or in the comfort of my own home? And we all know where the vote goes. 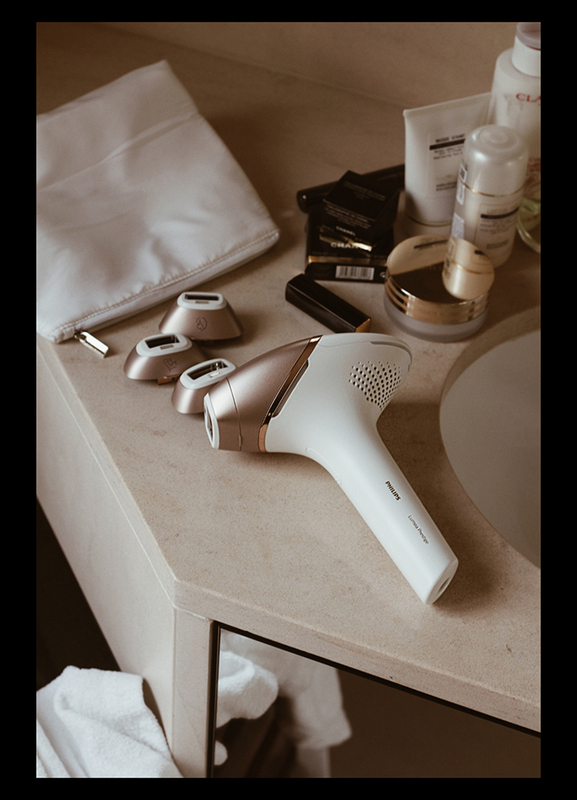 Last year I partnered up with Philips to test their latest product - Philips Lumea Prestige and I was more than satisfied with the results: hairs naturally shedded in the following couple of weeks post-treatment, and any re-growth was inhibited, resulting in silky-smooth skin for longer. But guess what? This lazy person decided to quit using it after summer ended, so here I'm. Asking politely myself (actually it's more like yelling) to start using it again, but this time more religiously. Lumea Prestige is a long-lasting IPL hair removal solution offering up to 92% hair reduction in just 3 treatments. Not to be confused with laser, IPL is short for Intense Pulsed Light - a new technology that puts hair into resting phase. It's easy and safe to use cause attachments are uniquely designed for optimal results in each body area. You can choose the right energy setting for your skin tone with the integrated SkinSensor. The product works by applying gentle pulses of light to the hair and the hair root, just underneath the skin. And if you're still not sure, be a geek, explore more on Lumea app where you will get the best step by step guidance and support you need, so you can feel confident about your treatment. - use the device every two weeks for six to eight weeks, use the device every two weeks for six to eight weeks, use the device every two weeks for six to eight weeks and you will have a hair-free skin. Tokom aprila, maja i juna meseca Lumea aparat se mo�e kupiti po sni�enoj ceni a u�teda je i do 26. 000,00 dinara u zavisnosti od modela aparata koji odaberete. Vi�e informacija mo�ete potra�iti OVDE.